VpCI-379 is a water-based corrosion preventive liquid concentrate designed to meet tough anti-pollution requirements. It is designed to protect ferrous and nonferrous metals in sheltered areas, indoor or in packages not in direct exposure to rain and outdoor elements. VpCI-379 is designed as a complete replacement for oil-based preventives. The wide dilution range (between 5% and 50%) allows flexibility to customize the length of protection required versus applied cost per square foot (or m2). 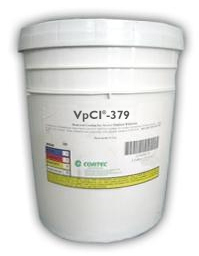 VpCI-379 is readily soluble and forms a clear solution in water. It is applied to metal surfaces by spraying or dipping. The protective coating is clear and will dry at ambient conditions to become dry-to-touch 30 minutes after application. VpCI-379 can be removed with conventional alkaline cleaners, and can be coated over with paints and primers without removal. If removal is necessary for subsequent operations such as plating, the usual preparatory operations of alkaline washing or degreasing easily removes the coating. In many operations, removal is not necessary since coatings, or paints can be applied directly over treated surfaces at dilutions over 1:5. Available in 5 gallon pails (Cortec Product # 12000097) or 55 gallon drums (Cortec Product # 12000101). 5 gallon drum weighs 50 pounds and ships under our standard shipping rates. The 55 gallon drum must be shipped by truck. We will provide you with a freight quote before we ship this product. The product should be stored in a heated warehouse to avoid freezing. VpCI-379 has a shelf life of up to 12 months.